I was hoping to hide my vintage Lionel train set from Finn until he got past his search and destroy phase with toys. Well, perhaps search and dissect is a more appropriate term. He really likes taking things apart and putting them back together. Unfortunately most of those things never make it “back together” again. He received that bit of DNA from me, I’m afraid. I can still clearly see the shock on my Mother’s face when once I performed a little exploratory surgery on our telephone. So knowing I’ve passed on that trait, I haven’t been keen on sharing my treasured childhood toy with him. Until now he hasn’t shown a great deal of interest in it. Probably because I’ve downplayed it whenever he asked about it. “Oh…that,” I would say, “I’m not even sure if it works anymore,” which was partly true. He received another train set as a Christmas gift this past year. It was geared more toward his age group and he has loved playing with it. He got up one morning and announced it was a train day. He put together an engineer’s outfit which really looked more like a pirate. Then he started putting together the train set that he received for Christmas. “What other train set?” I asked, acting dumb. He narrowed his eyes. “Mommy already told me I could” he said. I turned to Erin with a mock look of having been betrayed. “Oh, I thought it was ok,” she said innocently. “Well it probably won’t work anyway,” I resigned. “Why? How old is it?” Finn asked. I had to think a moment. It’s over 40 years old and I don’t remember the last time I ran it. I brought down the box, dusted it off and unwrapped the brown paper. It’s not in mint condition for sure. It was well played with in its day, and I cut holes in the box so it could double as a tunnel. But most of the cars were still in good condition. He wanted to do it himself so I only helped with the attaching of the control switch and a little track adjustment. Finally the moment of truth came and we flipped the switch. It started right up—making its way around the track with just the slightest wobble on the curves almost as smoothly as it did 40 years ago. Finn and I both were a little shocked. I really could not believe it. I immediately launched into my “they-don’t-make-‘em-like-they-use-to” rant while Erin smiled and nodded in a “you boys and your trains” kind of way. Finn ignored me completely, his attention fixed on the train. We make bread fairly often in our household. 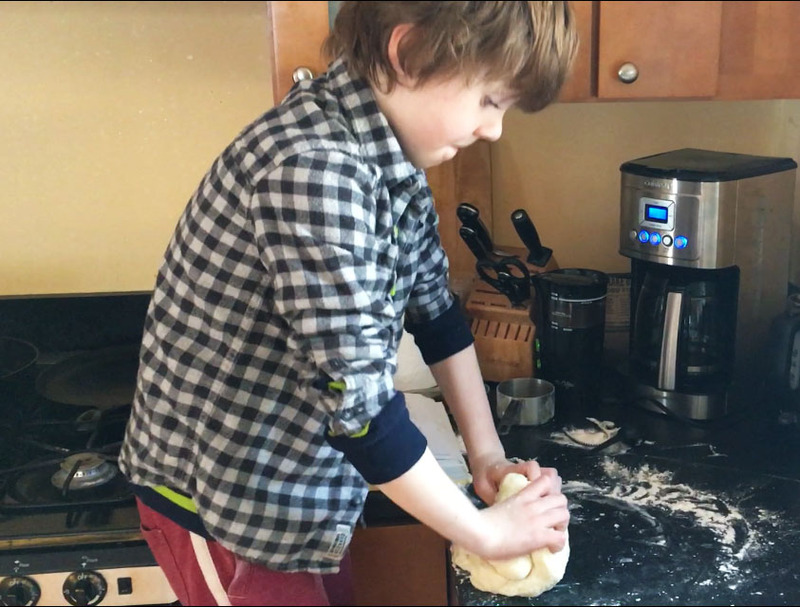 “Cooking class” has become part of our homeschool curriculum, but making bread has been a part of our routine for some time. Finn’s preschool and kindergarten years at Acorn Waldorf School reinforced that with a weekly routine of “bread day,” where the children mill the grain and form their own tiny loaves of bread. Finn often brought home little bread animals he had formed, most often snakes. A couple of years ago I got inspired to make a sourdough starter from scratch after watching Michael Pollan’s series Cooked. In one of the segments he describes the origins of bread making in ancient Egypt, how yeast is in the air and anyone can make a sourdough starter. I decided to give it a try. I made a mix of flour and water in a bowl, let it sit for a few days and soon it started to bubble. I was so excited! Then it started to smell a little sour and it didn’t turn colors so that meant it worked! I have to admit the first time I made bread with it, I was a bit nervous wondering if it was going to make us sick. But I have since heard from others who have made their own starters, that if it goes bad, you’ll know it. Over two years later the starter is still going strong. I don’t know how many loaves of bread I’ve made with it but I’ve learned to make two loaves at a time. Because when it comes out of the oven, everyone wants a slice (or two) of warm bread. You can’t rush bread making. It slows you down and makes you wait. There’s a lot for a little one to learn in the process. The measuring. The science. The delayed gratification. Finn especially enjoys the punching down phase after the dough has risen. This week we made bread and Finn decided he wanted to do it by himself. There were a few brief moments that required my assistance but for the most part he did it. I was caught up in the moment watching him turn out the slightly sticky dough onto the floured counter and figuring out how to get into the rhythm of kneading. In a short time he was turning and folding, turning and folding. Then my thought was interrupted by an even more ancient form of human behavior: playacting. “Oh hello!” Finn said talking to the dough “Who are you? Who me? Oh, well actually I’m just… AAAHHHH!” he yelled as he raised the dough above his head then smashed it on the counter. Whoever it was met their demise as he pounded them to smithereens. Then he started the routine over again. I wonder if the kids in ancient Egypt made bread this way. My early childhood memories came rushing back first, many of them bold and clear as if they happened yesterday. It could be because he was the most patient teacher with me when I was around Finn’s age. He showed the same patience with his many grandchildren. I try to be that patient with Finn now. He was a man who loved humor. He consistently called our friends by anything other than their given names, leaving them a little confused until they eventually “got him”. And he often shared jokes he had written at meal times. We always laughed, not because they were always funny, but he had a way with the delivery. Animals loved my Dad and, at home, he almost always had a dog at his side for which he would provide a speaking voice. Many mornings I woke to the ongoing “dialogue” between my Dad and our pet. Mr. James Wyatt DeWitt, 91 of Dadeville, passed away Saturday, December 29, 2018 at Russell Medical Center in Alexander City, AL. James DeWitt was born May 23, 1927 in Greensboro, AL. 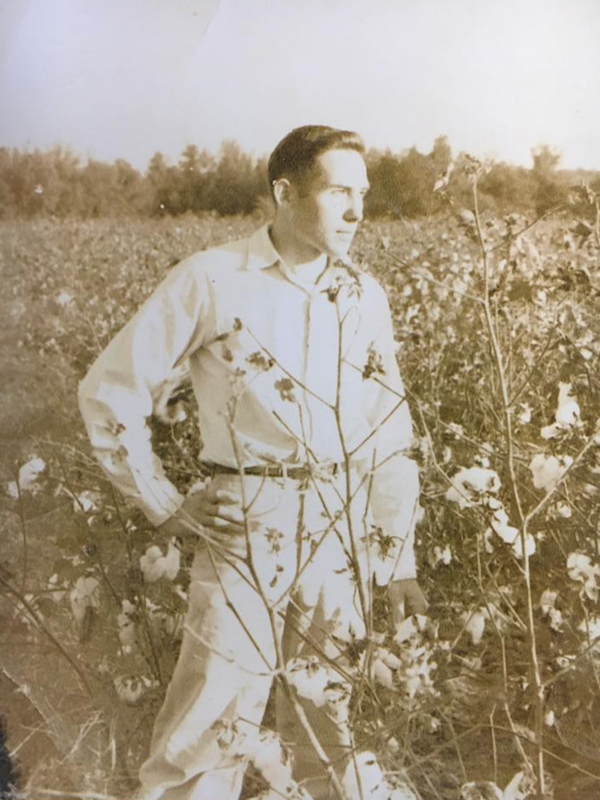 He joined the Navy out of high school and after discharge returned to attend Auburn University earning a Masters Degree in Vocational Agriculture. Over the next 39 years he taught high school Vocational Agriculture and Construction inspiring students, some who have continued to visit him. He was a member of the United Methodist Church, teaching Sunday School Class and participating in activities including mission trips, some internationally. Through the years he also owned and operated a farm and nursery. His love for construction, farming and growing plants continued into retirement. He contracted the building of a house on Lake Martin that included a wood shop, conservatory for plants and vegetable garden. His greatest love was for his surviving wife of 64 years Roselyn DeWitt and six children Wyatt DeWitt, Carol Txipama, Tim DeWitt, David DeWitt, Andy DeWitt and Lyn Allen, 12 grandchildren and 6 great grandchildren. He is also survived by siblings Oscar DeWitt, Tom DeWitt, Robbie Jones and Bill DeWitt. He is predeceased by his brother Sam DeWitt. Memorial Service will be held, Friday, January 11, 2019, 2:00 PM at Auburn United Methodist Church Founders Chapel. Visitation will follow the service. In lieu of flowers the family requests memorial donations be made to the AUMC Mission Fund P.O. Box 31356 Auburn, AL 36831. Finn and I are roadies right now. Erin is performing with the Omaha Symphony in their annual Christmas show and we’ve come along for the ride. It’s kind of surreal sharing this experience with Finn. The last time Erin and I spent more than a few weeks in a hotel we were touring together. Long before Finn was a thought. As we were packing for the trip it felt somewhat routine figuring out what to take so we could maintain a semblance of home on the road. 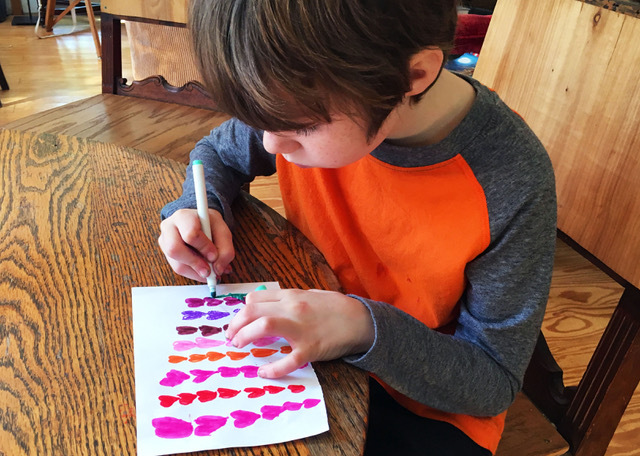 Finn filled his small suitcase with a careful selection of toys, Legos and art supplies. Homeschooling has made things a little less complicated to some degree. And there are plenty of “field trip” opportunities. I just have to keep reminding myself that we are not on vacation. Before we left, Erin and I scoped out the museums. Our halfway point to Omaha was Cincinnati, where Erin is from. The timing worked out so we were there for Thanksgiving with her family and Finn could have some quality time with his cousins. Erin had always been fond of the Cincinnati Art museum and had mentioned one of her favorite paintings was Van Gogh’s Undergrowth with Two Figures, on display there. There never seems to be enough time to fully appreciate everything in a museum. This is especially true when you’re with a seven year-old who wants to zip from one room to the next. Eventually we found the painting and Finn ran right up to it. Then he pretended to paint furiously, with his hand about an inch from the canvas. “You might touch it accidentally and damage it,” I said. “No I won’t, the paint’s very thick. Look,” he pointed again with his finger perilously close to the canvas. “Step back!” I whispered intensely, moving him back with my hand and expecting to hear an alarm go off any second. It’s not that he hasn’t been to museums. But it has been a while. And we’ve most recently been to children’s museums where you can touch everything. Still, there was a small part of me that expected him to react with a little more reverence and awe. I always kind of get butterflies when I see a famous painting. Thinking of the energy it took to create it and the number of people who had to believe in it enough for it to be hanging here on this wall 120 years later. For a moment I was able to get him to step back and just look at it from a comfortable distance. “The trees are purple. Why are they purple?” he said. 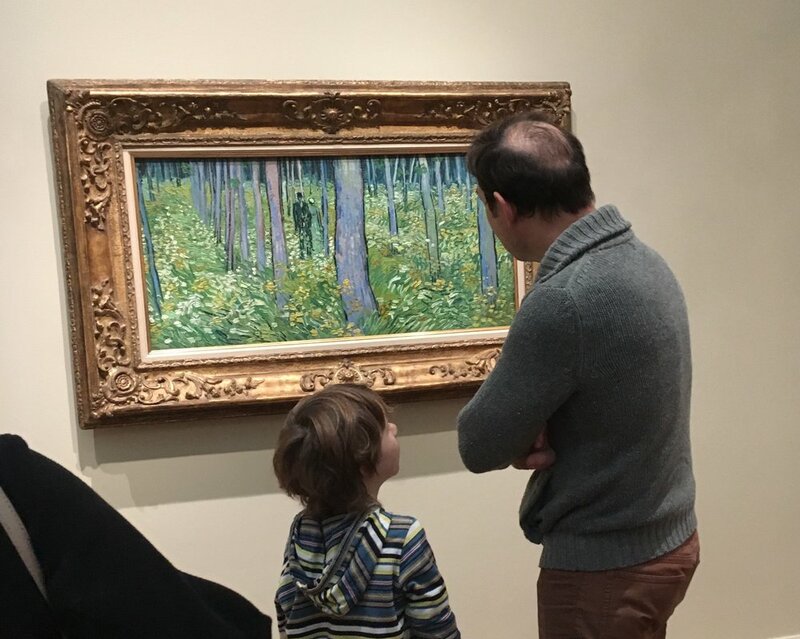 Years from now, after a dozen or more museum visits, I’m sure he will feel the awe. But this time it was pure curiosity and enthusiasm. And for now I’ll take that as marks of a successful field trip. Homeschool is now in session. The first few days were exhausting, my mind pervaded with doubt. Is it going to be enough for him? Is he getting the knowledge he wants/needs? Can I do this? Am I a good teacher? Luckily Finn is not one to be silent if something isn’t working for him. Back in the Summer when we were talking about homeschooling, he was inquiring about what it would be like. He asked what he would be learning. “What do you want to learn?” I asked. “Well, definitely POTIONS!” he said, his thoughts firmly swirling in Harry Potter world. “And of course ABC’s and stuff like that,” he said. It turns out the ABCs are a good place to begin. Though he has been writing for quite some time, he’s never really learned uniformity of letters, etc. We eased into it by drawing shapes and working with clay. Thus far we have essentially focussed each day around a letter. We explore the shape of it, the sounds it makes and all the words we can think of that begin with it. And at the end of the day we draw an artistic interpretation of the letter. Then the next day, another letter. It’s amazing now how fast the days are passing. My friend Ian, having learned from previous conversations what we were doing, heard Finn talking about “M”. “You’re already on M?” he said, surprised. It got me thinking about how our days will be structured when we run out of letters. But I have some ideas. And our days are not only about letters. We do our daily exercise, which Finn leads. He has some very interesting names for his exercise creations. I’m very fond of “the folding snake” which looks like a combination of a few yoga positions performed in quick succession. But my absolute favorite is running in place, which he calls “the runs” and the dance moves he includes. Afterwards we have a little meditation before we formally begin. Mondays, he has a music lesson with Erin (which we call Music Mondays with Mommy), Wednesdays he has art with me and cooking with Erin. After a little convincing, he now sees how recipes are very similar to potions. And we’re noticing that he is more willing to eat what he has helped prepare. Other advantages of homeschooling that I’m noticing right away are: Start time is flexible, no rushing out the door. He gets as many ‘turns’ at the chalk board as he wants and he gets all of his questions answered right away. “Lessons” tend to move along at a faster pace than I expected and if we veer off on a tangent, that’s ok. Lack of energy is a hurdle some days (on both of our parts), but regular exercise, and remembering to have snacks helps that. The biggest challenge is reminding myself that we’re doing just what we need to be doing. It’s still just the beginning, but I suppose that’s the best place to start. Our brief summer vacation is a memory now. A few days is barely enough to catch one’s breath. This year we met up with Erin’s family on a little Island in Lake Erie. The fact that the island was on the Canadian side made the trip a little more exciting. The house we rented was right on the beach. The water was calm and shallow so the parents could relax on the sand without being on edge about sudden waves. The largest ones were an inch or two high. It was calming for all. The cousins fell instantly into their rhythm, building sand castles, splashing and playing made-up beach games they never seemed to tire of. Evenings were full of board games and adults in conversation until the wee hours. Eventually the kids went to bed exhausted. I noticed Finn mimicking his older cousins, acting more mature. A few times when I tried to help him with things with which he normally required assistance, he stopped me. “I got this”, he would say. He spent so much time interacting with the cousins that the endless stream of questions we’ve become accustomed to answering from him diminished substantially for those few days. Having a little time to sit and relax, I found myself thinking about the coming year of homeschooling and the unknown challenges that lie ahead. Homeschooling is not uncharted territory. Just untravelled for us. We’ll be on the journey together, drawing from the experiences of others and creating a unique experience. The Ferry ride to and from the island was a first for Finn. To be on a boat in the middle of the water with no land in sight for part of the journey, was something he had never experienced. He wanted to spend most of the two hour ride standing at the bow of the boat. He couldn’t get enough of the wind in his hair. Yes, homeschooling may present many challenges. But I’m counting on the insights to balance things out.